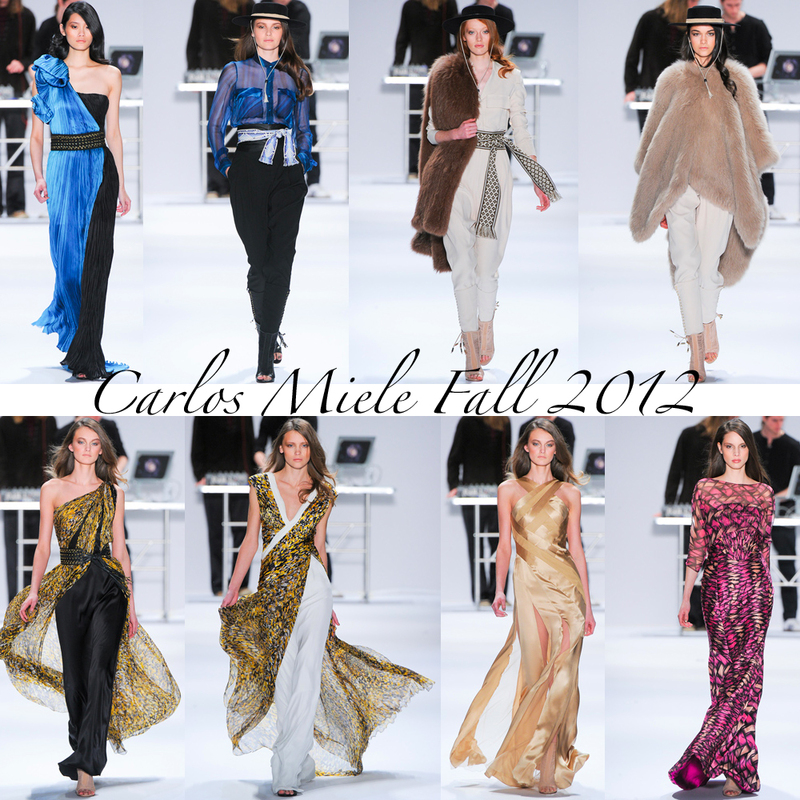 There was no denying that Carlos Miele was inspired by his country of Brazil-- ponchos, boleros, and crepe pants pranced up and down his Fall 2012 runway. I found myself so inspired by this whole collection. It definitely has to be one of my favorite Fall collections. Pamala of Addikted2Fashion just kept saying that she could see me rocking those boleros. Which is so true, I'd totally rock his hats and without a doubt the fur poncho. I'm always intrigued to see new things and new inspirations. Some shows get pretty boring since they are something you've seen before so it's like a breathe a fresh air when you see new takes on clothing and thats exactly what Carlos Miele did. Would you rock the Brazilian inspired clothing? I might be a little crazy but I can't help myself into diving into some the spring trends already. I have so many new spring pieces waiting in my closet to be worn. And to me when I hear upper 50's it means time to break out at least some of the spring stuff like the pastel bottoms and tops. I have been going on a shopping binge lately for spring clothing and accessories.I'm just so drawn to all the pastels and neons. These Forever21 were my latest buys from there, I went a little bracelet happy...A girl always needs new accessories. Have you started wearing any spring trends? Which ones are your favorite? I'm a sucker for sunglasses. They can really make an outfit and you can basically build a whole look around a pair. I have about 20 pairs of sunglasses (even though I always wear the same two) but I always feel the need to buy more. I'm in love with Karen Walker's sunglasses. Each are unique-- I especially love her use of color and the architecture of them. The Patsy Sunglass and Pegs (both are seen above) are my favorite pairs of Karen Walker sunglasses. What do you think of Karen Walker's frames? I'm a firm believer in karma-- what you put out there in the world is what you get back. Maybe it's the hippy inside of me that believes this, but I was taught this by my mother and I have seen proof of this in my own life. This was definitely proved to me this past season at Mercedes-Benz Fashion Week when I was surrounded by selfish people. I couldn't believe the attitude of entitlement around me-- woman fighting with security to get let it in early even if they had a standing room ticket, people stealing gift bags from the front row seats, people pushing and shoving on the standing line, etc.. It's the most ridiculous thing ever and I never want to be this way. I feel blessed enough even to get an opportunity to go to New York Fashion Week shows. What does this have to do with the Venexiana Fall 2012 show? Well I was invited to the show but with a standing ticket, I waited online and when we were ushered in I grabbed the first empty seat in the back row that I could find. Well the two people in front of me were much taller then me so I couldn't see anything, I turned around to the girl behind me and told her that she could take my seat but I wasn't sure if she'll be able to see. Luckily for me the PR heard me and turned to me and was like "Oh honey do you want a front row seat?" How could I turn down that invite!? He promptly ushered me to a front row seat! Amazing and lucky. I got to see beautiful gowns close up. The details on the back of the dresses were really amazing-- one shoulder straps, draped backing, long trails. Her work is more couture then ready to wear. A lot of gowns that could easily be seen walking the red carpet. 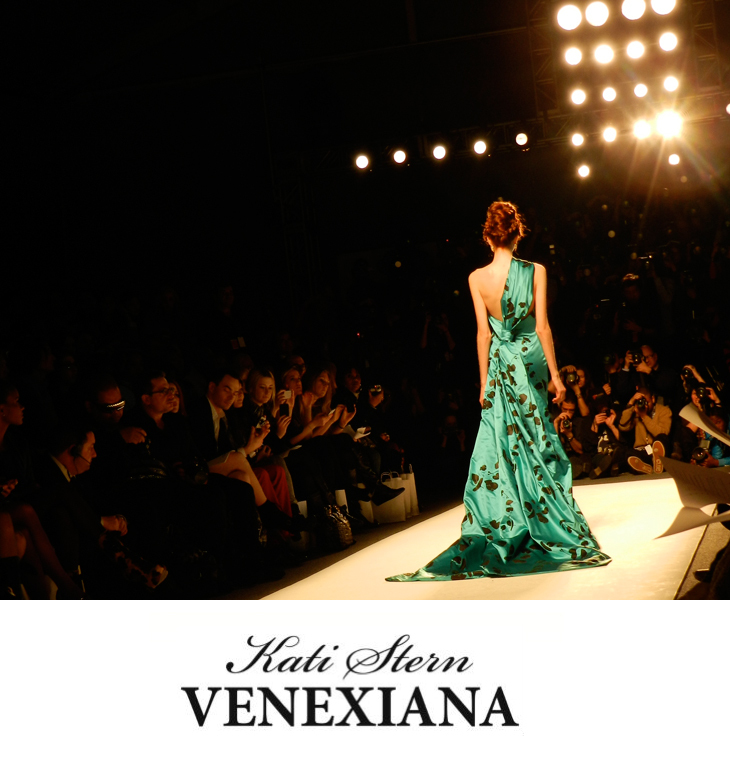 What do you think of Venexiana Fall 2012 gowns? Pastels, maxis, and light-airy frocks were nowhere in sight for Tibi's Fall 2012 collection. 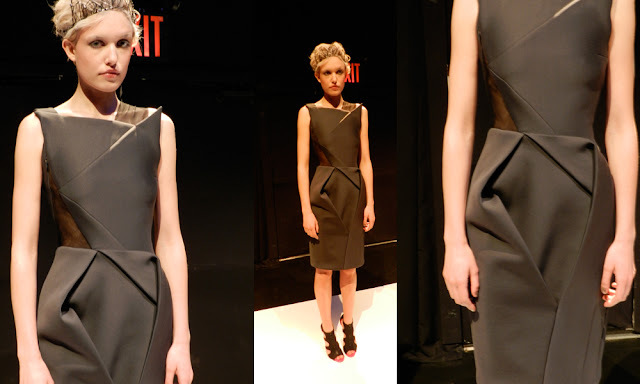 Instead designer Amy Smilovic went a different route with a more sophisticated look for the Fall. The collection was reminiscent of Celine like structured turtle necks and Miu Miu style bird prints. 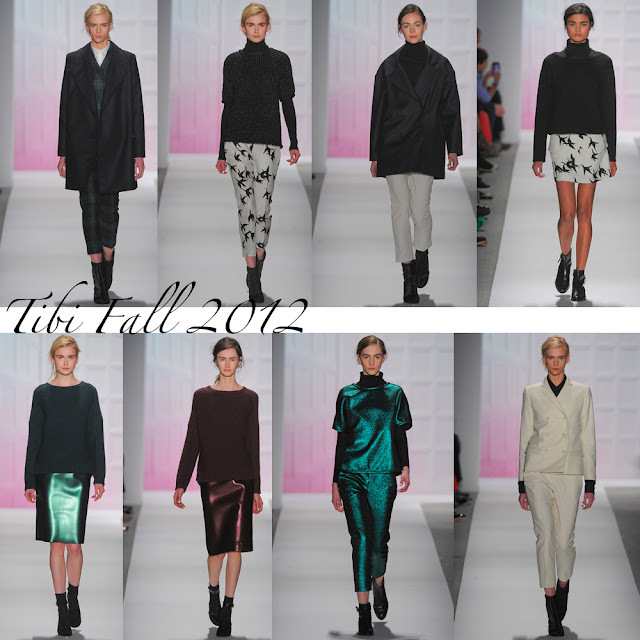 My favorite looks from this collection were the metallic skirts, along with the shiny green sweater and patching pants. I felt refreshed after seeing these pieces come down the runway since it was something that I had yet seen. 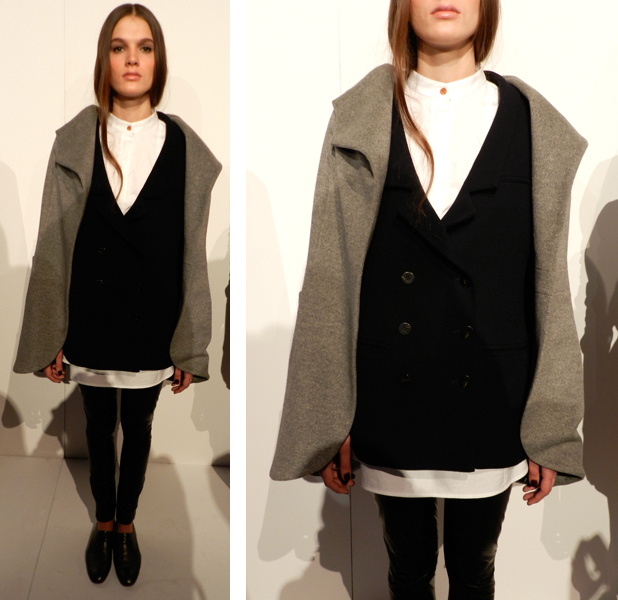 Plus it gave it the young playful vibe that Tibi is known for having. I also was happy to see that oversized blazer styled coats aren't going anywhere-- they are the perfect layering tool. 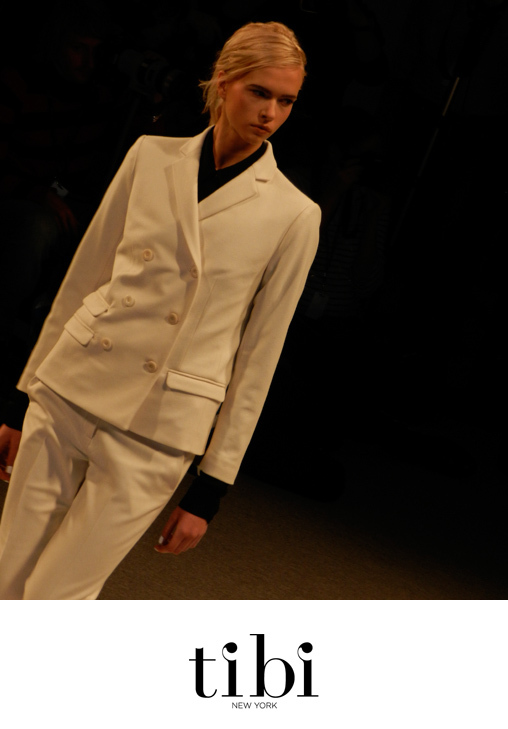 No matter what you think of the collection there is no denying that Smilovic has amazing tailoring skills. I can see it now-- woman who already love designs such as Celine and Chloe walking into Tibi and buying her clean cut tailored pants by the armful. These pants are perfect for work and play for the Fall months. 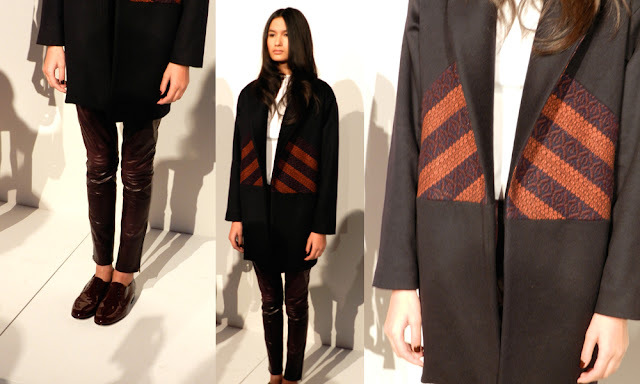 What do you think of Tibi Fall 2012 collection? Do you think you'll go bold and wear metallic foil skirts? During New York Fashion Week I wore my glitter heels from Steve Madden Girl and it dawned on me that I barely ever wear these heels. When I do it's usually a more dressy outfit/affair: New Years Eve, my birthday, and NY Fashion Week. I then challenged myself to figure out how to wear these shoes for a day time look. Why not wear glitter booties for daytime when glitter heels and loafers can be taken to a casual look. I digged through my closet and draw for clothing that deemed work appropriate and pieces that every woman should have in their wardrobe. I first started with the boyfriend jean and worked myself around that. Why the boyfriend jean? The boyfriend jean add a relaxed look to the whole outfit. It also adds a touch of masculinity to something so feminine and girly like glitter boots. With that being said I wanted to play around with a feminine boyish look. By taking a shirt like bow tie top it plays on the boyish look but still has a girly edge-- especially one that is printed like polka dots or that is tailored with a skinny bow tie like the Aritiza Sleeveless Sabrina Blouse. Adding a blazer into the mix adds professional look, make sure it's a bit more tailored and fitted since you don't want to look to baggy in your clothes. Finish off the look with a tote or a satchel bag. These bags fit all your necessary needs and keep it all looking together. What do you think of this look? Would you wear glitter boots during the day? 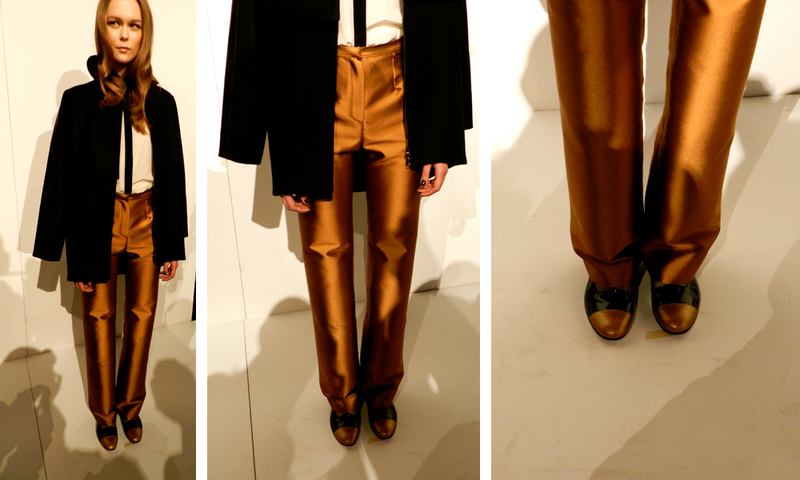 Rafael Cennamo Fall 2012 Presentation was a little like stepping onto the set of a prom horror movie-- aka "Carrie." With the overly teased hair and prom queen crowns I was expecting a little bit of blood or maybe even leaves in the midst of the hair. Then after viewing the collection and really looking over the pictures did it dawned on me how the hair was a great juxtaposition to his collection of detail orientated and structured dresses. This collection was full of red carpet looks and elegant dresses for woman of every age. The drapery on some of the dresses were amazing like the white silk draped back gown. 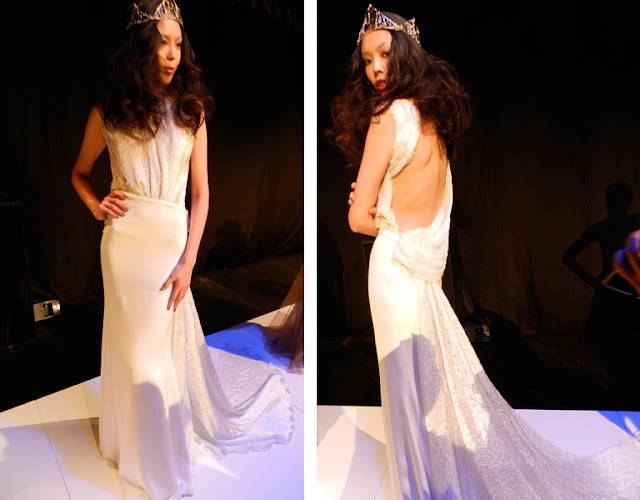 I could see many brides wanting to walk down the asile wearing this open back draped dress. Also the build of the steel grey structured cocktail dress amazed me. It's such a strong look with bold lines. I'm glad that he did a presentation since it really allowed the viewers to see the details and the work. 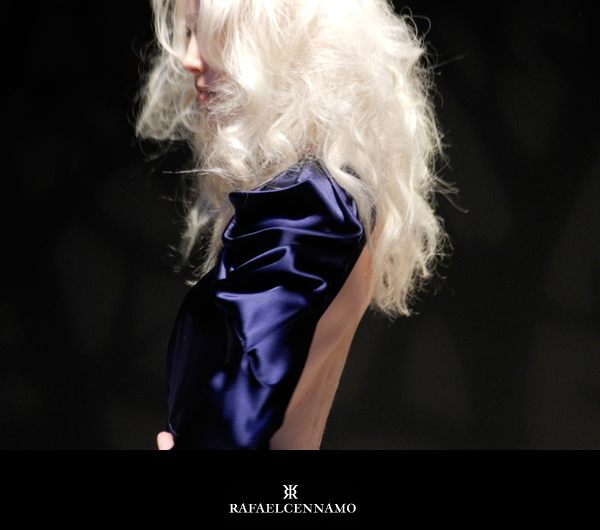 What do you think of Rafael Cennamo Fall 2012 Presentation? Three day weekends are the best especially when after a week of running around. Not only did I got to 22 NYFW shows but I also worked as in went to my "real" job-- or at least the one that pays me. I'm still working on getting all updates together for you all but since I am one person I can only do so much. But I thought it would be nice to take a break from some of the NYFW week stuff to update you on well other things that are going on. After spending a week in high heels its nice to stay close to the ground. It's also nice not have to dress up. These pictures were taken on Saturday before the bf and I went into the city to visit my Grandma who is in the hospital. She just turned 80 in January and now is having some serious heart problems. Since she is 80 she refused an open heart surgery but instead a procedure that will help try to get her heart in a regular heat beat pattern. She will also need to take heart medication on a regular basis. It's hard to see the ones you love getting sick and older. It seriously makes you think how fast life really goes. Truly enjoy the life you live. Live like every moment as if its your last and love like there's no tomorrow. 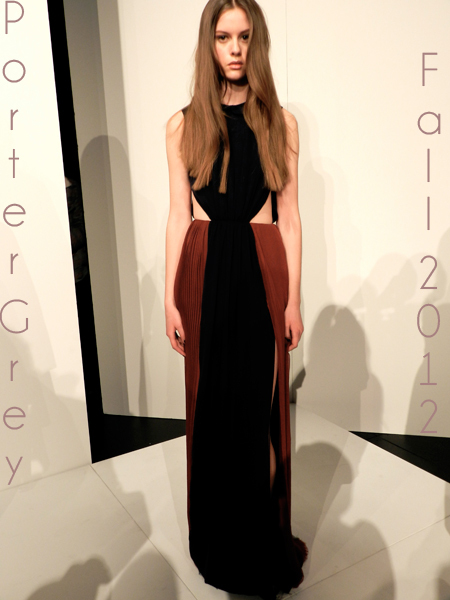 I'm not sure where to even begin with Porter Grey's Fall 2012 Collection. This fall collection is really every fashion blogger and street style queen's dream. Sisters Alexandera and Kristen O'Neill hit the nail on the head- nothing but wearable clothing and timeless pieces. This was seriously my favorite collection so far this season. I couldn't believe the wearablity of the clothing, the craftsmanship in each garment, and the styling. Oh the styling-- the mix of boyish flare with oversized blazers, hard edge details with leather with the perfect mix of soft feminine pieces like peter pan collars and short hem lines made my heart flutter. I could see myself in each and every piece-- and that doesn't happen very often. This collection is definitely for the young at heart and for those who are young with style. I had such a hard time picking out pieces to showcase here to give you all a glimpse of the collection. I knew I had to put the cut out maxi dress up since it literally made me swoon and the wool shorts with the leather details since I need to get my hands on a pair of them. I'm so excited for these sisters career, I can literally see this label being a must in every fashion blogger and ANY women's closet. What do you think of this collection? Do you see it being a stable in your closet?